Target 1 monster “Fur Hire” in your GY; Special Summon it in Defense Position. You can only activate 1 “Mayhem Fur Hire” per turn. Mayhem Fur Hire is the archetypes Monster Reborn. A quick-play is great, giving you the flexibility of using it either turn. Defense position isn’t too bad to have the Fur Hire monster, though it limits your offense if it’s your turn. This card is more of a defensive and combo card than offensive. Use it during your opponents turn to Special Summon a Fur Hire, in turn activating one of your other Fur Hire monster’s effects like Donpa and Recon to destroy cards on the field. It can be used to get one of your big guys back to be a wall, as well as activate their effects off their Special Summon. It is a good card to start the combos this deck likes to do, and with the Quick-Play status, allows for combos during either turn. Mayhem Fur Hire is a Quick Play Spell Card that lets you Special Summon a targeted Fur Hire Monster for free once per turn. 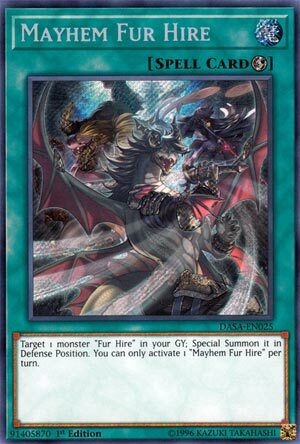 I’m not sure why this card calls them monster Fur Hire instead of Fur Hire monster, but that doesn’t change anything. The Special Summoned monster needs to be in Defense Position, so no Links, but obviously you can go into Links. Not perfect in the opening hand, but you can set it and forget it like Back to the Front. Mayhem Fur Hire is just good support since it can trigger low level Fur Hire effects during the opponent’s turn. Definitely worth running in multiples. We continue this week Fur Hire with the Monster Reborn Fur Hire, Mayhem Fur Hire. Mayhem is a Quick-Play Spell, which is nice to make it a little more versatile. When activated, you can target a monster Fur Hire in the GY and Special Summon it in Defense Position. You can only activate Mayhem Fur Hire once per turn. Any deck getting a themed Monster Reborn is great, and Fur Hires could really use it. Most of the smaller Fur Hires have low ATK, so if you are reviving them, it should be fine that they go to DEF. Mayhem Fur Hire is a great card for the deck. Short, sweet, and to the point. Make sure you run it in your decks Fur Hire. Art: 3/5 A lot going on it seems, can hardly see it. Art: 4/5 also, colorful, fun, quite intense in that scene, no?